Subscribing to the axiom that a minor work of a Master has much significance than the masterpiece of a mediocrity, I introduce this minor book(let) of poet Kannadasan (1927-1981) to the readers. The item of interest was an electoral ephemera and a diatribe by Kannadasan on the beloved M.G.Ramachandran (MGR). After founding his new party Anna DMK in 1972, MGR contested the 1977 Tamil Nadu Legislative Assembly election in full force and was aiming for the chief minister position. At that time, Kannadasan was aligned with the Congress Party led by Indira Gandhi (then known as Indira Congress). The Congress Party (‘Old Congress’) in Tamil Nadu was led by older leaders especially K. Kamaraj, though Kamaraj himself had passed away in 1975. In Tamil Nadu, due to Kamaraj’s leadership ‘Old Congress’ had firmer roots in comparison to Indira Congress which lacked prominent Tamil politicians who had mass appeal. Kannadasan was an exception, due to his versatility in talents. Both MGR and Kannadasan were born ten years apart; MGR in 1917 and Kannadasan in 1927. Both died in the space of 6 years; Kannadasan in 1981 and MGR in 1987. Their professional careers in stage, cinema and politics overlapped. Both had worked together in cinema and politics, and both had worked with adversarial relationship as well. While Kannadasan was a founder member of DMK, MGR joined it only in 1953. While MGR was originally a Congress Party admirer, Kannadasan moved into the Congress Party circles in mid 1960s. Last, but not the least, both were admired by Eelam Tamils for their firm conviction on Tamil rights and the fan circle for both in the island exceeded millions. 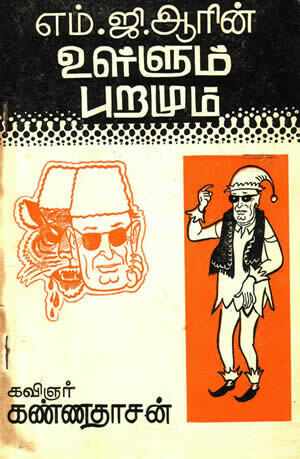 Kannadasan’s book(let) had the title MGR’in Ullum Puramum [MGR’s Interior and Exterior]. It had 48 pages, and was published by Muttiah Publisher, Chennai. The 2nd edition was published in June 1977. Considering the fact that Kannadasan’s given name was Muttiah, one could partly guess that the poet himself had taken the trouble to publish this diatribe openly. The UNESCO definition for a book states, the publication should be a bound, non-periodical publication having 49 or more pages, with the exception of those published for children. As such, this minor work of Kannadasan strictly qualifies as a booklet. I provide below some of the details that appear in this booklet in English translation. Being an insider of Tamil movie world and as a producer of a few Tamil movies, Kannadasan specifically provided some figures relating to costs in Tamil movie making, circa late 1950s-early 1960s in this book(let). These figures may be of some historical interest. Kannadasan founded Kannadasan pictures and produced movies like Malai Itta Mangai (1958), Sivagangai Seemai (1959), Kavalai Illatha Manithan (1960), Vanampadi (1963) and Karuppu Panam (1964). “I planned to take a movie with him having the title ‘Oomaiyan Kottai’ [Fort of a Dumb Man]. I offered him 21,000 rupees. He didn’t act in that movie for even an hour. He also didn’t return the money I gave him. If I went for him to get some money in urgency, he would give me money, after having my promissory note. 99 out of 100 producers who come forward to make movies do not have the entire sum to produce the movie. They may have only half the amount, and the balance they get on credit. As far as I know, only producer T.R.Sundaram [of Modern Theatres] had the wealth to make a movie without any credit. Usually, one movie may cost 700,000 rupees to 2,000,000 rupees. That amount of money, no producers may have at the beginning. However, they try their best to make the movie on credit and get some profit for their effort. If they thought of making a movie with MGR, ‘danger sign’ may hang on their neck. If he felt that the producer may get some profit, MGR will make it that the producer will bleed from his neck. Kannadasan did name some specific examples of actors and producers who suffered from MGR’s high-handedness. These include, comedian J.P.Chandrababu, fellow DMK actor S.S.Rajendran, comedian ‘Kula Theivam’ Rajagopal, T.S. Venkatasamy (a production manager in Jupiter Pictures and the husband of actress U.R.Jeevaratnam) and movie producer Naidu (and once owner of Golden Studio) who financed an MGR movie Baghdad Thirudan [Thief of Baghdad, 1960]. “If MGR movies sold for, say 10 rupees, expenses for that movie would reach 20 rupees. For that Baghdad Thirudan movie, they would have spent 30,000 rupees for a set. The next day, MGR would want a ‘new set’. By this type of cost over-run, it was expected that at the end of shooting, the movie would cost 500,000 rupees in red. MGR had demanded that to complete the movie, additional 200,000 rupees was to be spent. Naidu had openly cried, and begged MGR. But, MGR wouldn’t budge. ‘O’ my God! I’ll turn into a pauper’ was Naidu’s mood, when he returned home. His blood pressure rose. He went to bathroom and wouldn’t come out after one hour or so. Others at home then forced open the locked door, only to see that Naido had died of heart attack. None could forget the cries of his family then. At his house, all who gathered were cussing MGR. Then, we saw MGR’s arrival with a full length garland and carelessly placed it on the corpse. Even now, when I look at Naidu’s house at Vijayaraghavachchari road, I feel like crying. Now, it has morphed into a hotel. Golden Studio had been abandoned. If a new actor entered the party (DMK), MGR becomes a bit nervous. He would do much and also spent money to see that actor fails in his effort to reach the top. He’d call the company that makes a movie with the new face and say ‘I’ll act for you at a lower rate’. He did this to me as well. I believed him and lost money to him. I had to stop the movie ‘Umaiyan Kottai’, after losing 62, 500 rupees and became a credit risk. With that experience, I thought of making a movie without a big star, and arranged to have T.R.Mahalingam for my movie, who was struggling then. I trusted my writing skill only to make a success of that movie. That movie, Malai Itta Mangai [A Virgin with a garland] in which Mahalingam played the lead role irked MGR. He challenged to all that it would fail, as the party cadres wouldn’t accept Mahalingam. To challenge that, I specifically wrote the lyric ‘Engal Dravida Ponnade’ [Our golden Dravidian state] and made Mahalingam to sing it. The movie was released. The song appeared in the opening scene. Party cadres appreciated the song, and applauded the scenes whenever Mahalingam appeared. For songs alone, that movie became successful. However, other independent observers who were insiders in the Tamil movie industry have recorded in their memoirs that the troubles faced by comedians Chandrababu and Rajagopal as well as T.R.Mahalingam were their own making and Kannadasan had merely exaggerated the role played by MGR in their downfall. “Within a few years after I quit DMK [in 1961], MGR wanted to demolish my career too. He forced some producers to drop me – those who would have said, ‘Only Kannadasan should write the lyrics; otherwise, there need not be any songs.’ Some producers who wished to please him, had to drop me and suffered. But he couldn’t dent my earnings economically. Secretly, they will get a greeting verse from me and would pay the full amount for it. MGR couldn’t pull my legs! The reason is this. Only four MGR movies were released in an year. My earning from them wasn’t enough for my daily expenses. However, in each year, 10-15 Sivaji Ganesan’s movies were released. Then, we had another 25 movies released that didn’t feature either MGR or Sivaji Ganesan. So, MGR couldn’t destroy my career. However, other artistes were not so lucky. Kannadasan was correct in stating that the chances for him to write lyrics to MGR movies evaporated after he quit DMK. But to be fair, MGR promoted new lyricists to the Tamil cinema, and a couple of old-timers who lost out to Kannadasan to compete with Kannadasan. 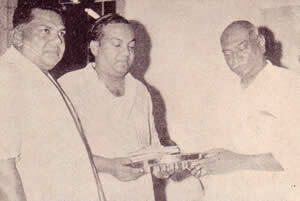 Those who did benefit from MGR’s munificence were new lyricists (poet Vali, Pulamaipiththan and Alangudi Somu) as well old-timers (lyricist-poets Suratha and Maruthakasai). It has been my cherished hope to write a dual biography of MGR and Kannadasan in English. I wait for time and a suitable publisher. These random notes may be considered as a backbone that will form the nucleus of my book. Ashish Rajadyaksha and Paul Willemen: Encyclopedia of Indian Cinema, New Revised edition, Oxford University Press, New Delhi, 1998, pp. 118-119.